The Tunze Aquawind is an especially low-noise aquarium ventilator provided with a 5 V low-voltage power supply unit. Moreover, it comes with an attachment means, which can be used for every aquarium edge up to 25 mm (.98 in.). It produces a laminar air movement over the surface of the water, accelerating the evaporation process and thus achieving a cooling of the water. Dimensions: 10.2" x 3.9" x 1"
Bought it because it was Tunze, thought it would last but after 3 months 1 Fan died then 1 month later the other fan died. It was nice while it lasted. I use this on a Reefer 450. It's basically two computer fans, with a right angle turn forcing the air out across the tank. More air output than the other aquarium fan I'd previously bought. It clips securely to the lip of a rimless tank, can't say about others. On my Reefer, I have a polycarbonate lid from Artfully Acrylic. This fan happens to sit in two grooves on the edge of this lid perfectly, angling down toward the water, considerably increasing the cooling effectiveness. Not enough air output, Overpriced. wish it had a tilt down feature so as to direct the wind more at the water surface. Using it on my 40 gal tank and so far works well. 2-3 degree decrease which is all I need. My Innovative Marine 40 was running warm around 81. The fan dropped the temp 3 degrees in 24 hours on low. Fits on my Fusion nicely. Well made in Germany, unobstructive, pretty quiet and looks good too. Excellent product. Low noise and visually unobtrusive. 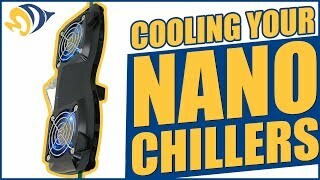 Removes heat from my lights and saves me from getting a chiller.